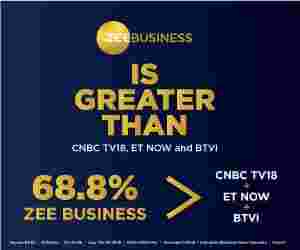 Zee Entertainment Enterprises Limited (ZEEL) today posted Rs 322 crore net profit for the quarter ended December 31, a rise of 28.5%, against Rs 250.81 crore in the same quarter a year ago. In the previous quarter, the company reported a net profit of Rs 590.8 crore, against Rs 238.4 crore in the year-ago period. ZEEL reported a consolidated revenue of Rs 1,838.1 crore for the third quarter of financial year (FY) 2018. Earnings Before Interest, Tax, Depreciation and Amortization (EBITDA) was Rs 5,94.4 crore. EBITDA margin for the quarter stood at 32.3%. Advertising revenue for the quarter was Rs 1,202 crore, a growth of 25.8%. After adjusting for sports, domestic advertising revenue grew 30.4% to Rs 11,37.3 crore. Subhash Chandra, Chairman, ZEEL, said, “It is very heartening to see the rebound in the economy after four quarters. The initiatives taken by the government had some short-term impact on the growth, but these measures will strengthen the economy in the long run." Punit Goenka, Managing Director & Chief Executive Officer, ZEEL, said, “We are delighted to deliver a strong operating performance during the quarter. The slower growth in the last four quarters was due to specific events which required advertisers to recalibrate spends. As the impact of these factors is now behind us, ad spends have bounced back strongly and outlook remains encouraging. The recent cut in GST rates across a wide category of products should aid the growth." "Our domestic ad revenue growth of 26% is a testimony to the fact that television continues new digital platform, Zee5, scheduled to be launched in February, will enable us to capture this growth," Punit Goenka said. ZEEL recently launched two channels -- Zee Telugu HD and Zee Cinemalu HD.